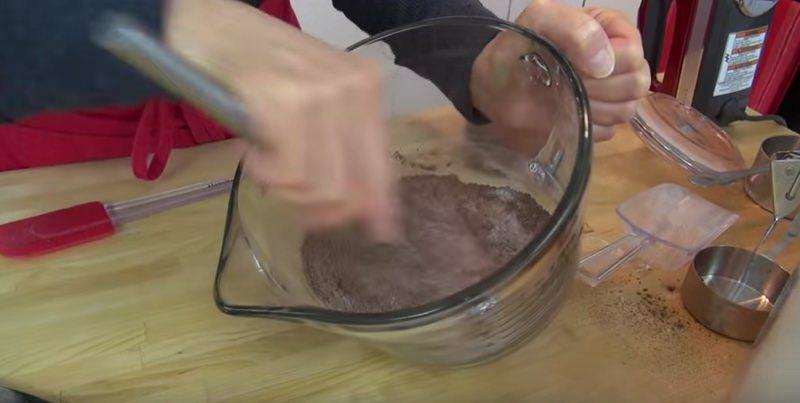 Here, Diane is sifting the cocoa powder to make sure there's no lumps. 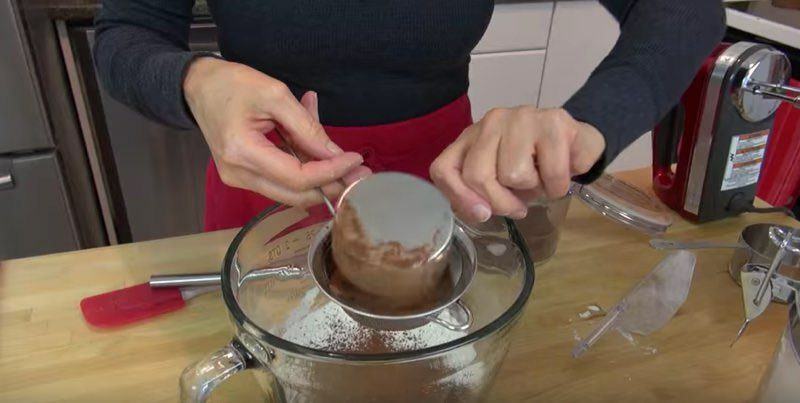 You don't have to do this step, but it does ensure that you won't have any dense clumps of cocoa that you have to smooth out, and you'll have a more even consistency to the dry portion of your ingredients. Stirring in the wet stuff will be easier. 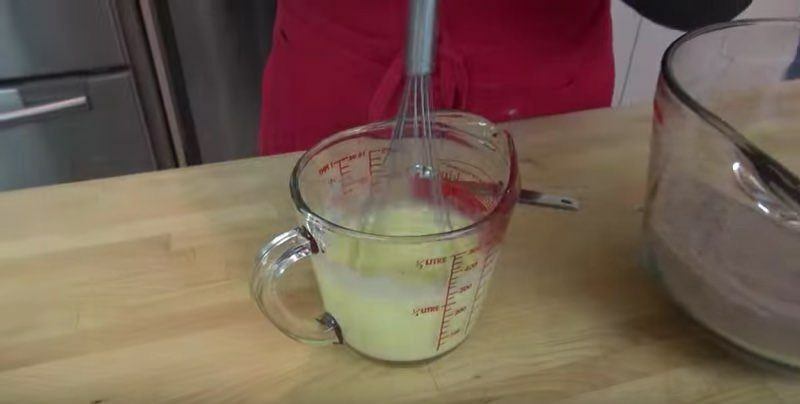 Mix together the buttermilk, oil, egg, vanilla extract and peppermint extract. 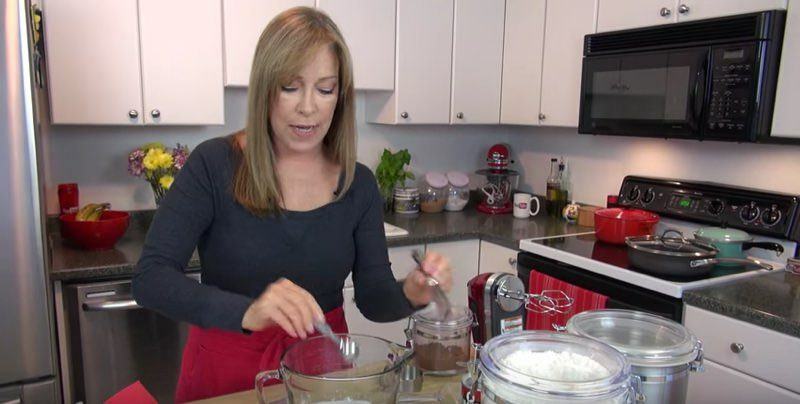 One interesting point Diane brought up was that she likes to use peppermint extract rather than regular mint. This was interesting! I guess most chocolate mint things use peppermint rather than other kinds of mind. Don't forget that there's also wintergreen and spearmint extracts too that may be worth experimenting with. But for me, I prefer the classic flavor. 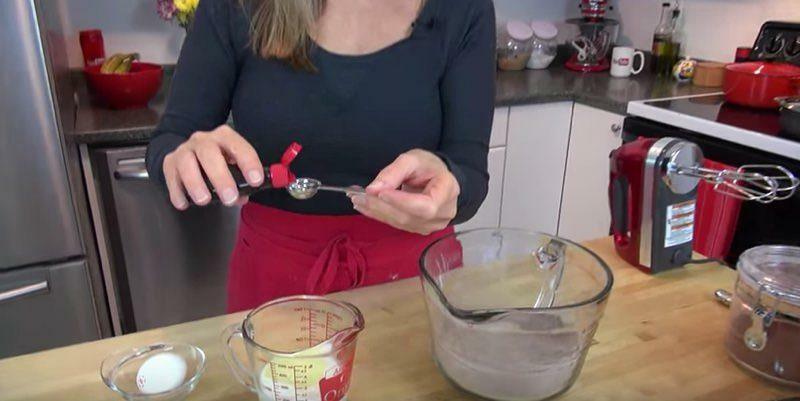 You can see her adding the peppermint extract below. 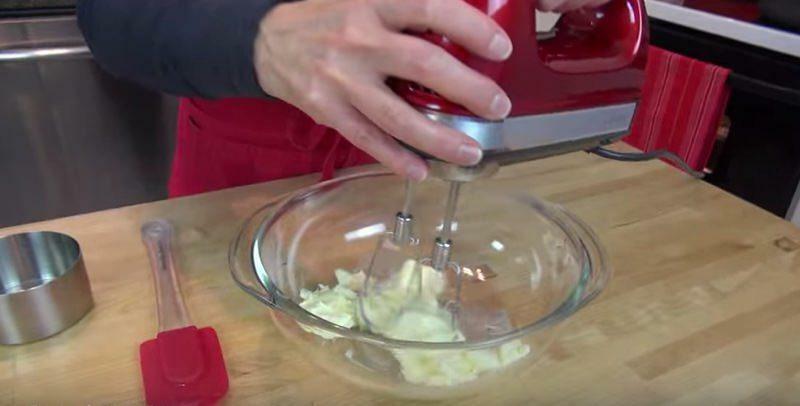 Whisk everything together to get an even mixture, then slowly add it to your dry ingredients to get a thick batter. The hard part of making cupcakes is over! 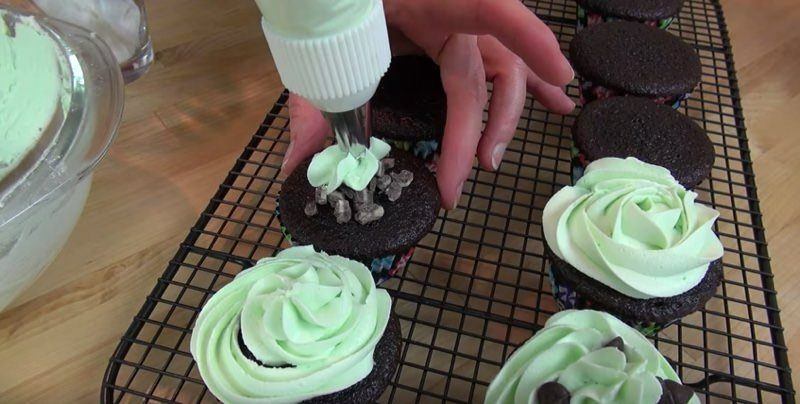 You can pour them into the cupcake tin and set them cooking. Caution! Don't fill the tins too high. Although it may look unsatisfying to have a partially filled cupcake holder, remember that these things will grow in the oven. Filling the tin too high will make them over flow and possibly stick to other muffins. Bummer! I always aim for half way to three quarters, but nothing more than that. The recipe asks you to bake them at 350 for about 20 minutes, but for my oven, that's too long and too hot. I always go at a lower temperature for longer, so I'll do 325 for 15 minutes, then check, add 5 minutes, and check. They should be done or very close. 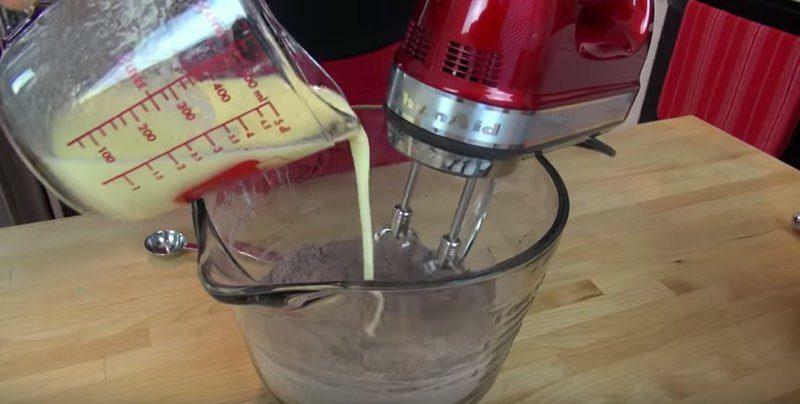 While those are baking, you can prepare the buttercream frosting. Actually, it's easier than you probably think. 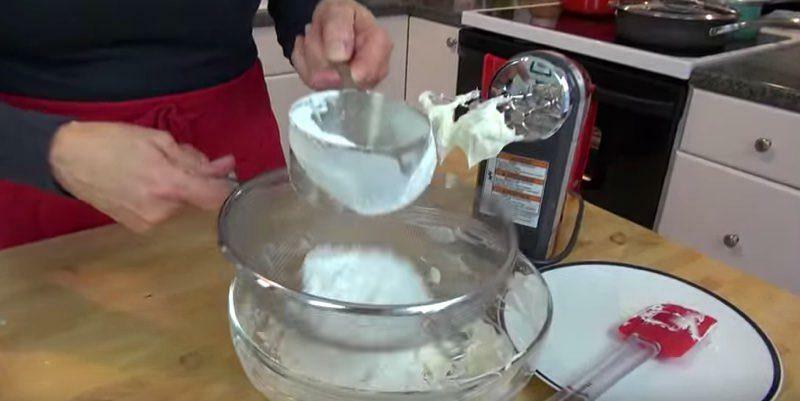 Step 1: Whip the butter. Step 2, add the sugar. Step 3, whip again. Step 4, add your food coloring, vanilla, and peppermint extract. Yup, these are gonna be some minty cup cakes! Step 5, fold in all that stuff with a spatula. 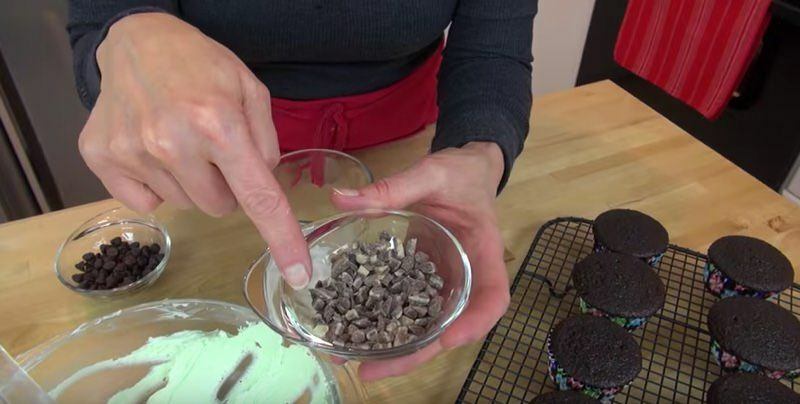 One interesting thing to try would be to make the chocolate portion of the cupcakes without mint flavor, and just have them be regular chocolate cupcakes with a mint frosting. 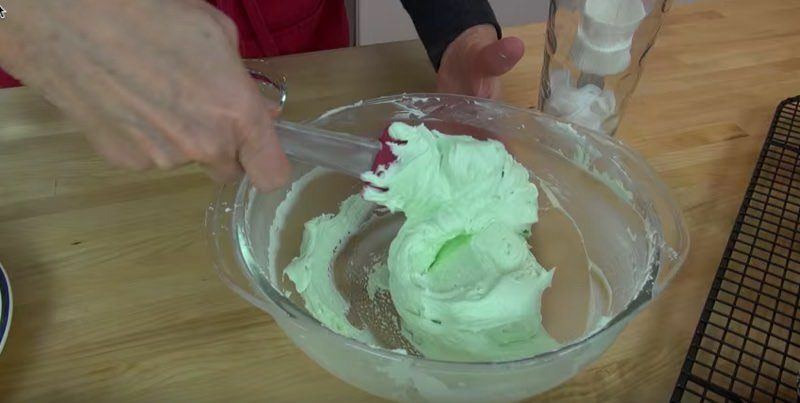 Or, although having green frosting is fun and kind of expected, you could do a chocolate buttercream frosting with peppermint extract. That's way more chocolate flavor! Although I think the mind candy would be kind of weird in the middle of a cupcake, it would be worth a try, and add to the chocolate mint experience. I'd like to crush up some Girl Scout Thin Mints and put it on there, or just put a whole one on top. Covering the candy with a frosting means there will be a fun surprise for anyway that takes a bite!